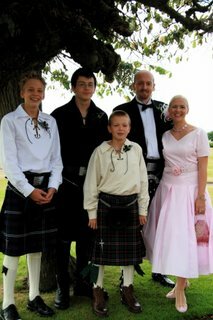 So here we are, I was very chuffed the boys wanted to wear kilts to the wedding and I think they looked very smart, No1 son was all in black for that traditional Goth look! My dress was made from a pink cotton with a tiny little cream square with a little beige line on it and I have to say was the hardest fabric to track down. Problem was I bought the shoes first, doesn’t everyone? Then had to spend various shopping days with various friends in various towns, with one shoe in my handbag to match the colour. Finally found this remnant while digging around in a HUGE pile of fabric while looking for some cottons for bags. Then I was worried that it wasn’t smart enough, then was worried that it wasn’t all going to come together and almost bought a dress when I arrived in Scotland, only lack of money and the prospect of shoe/handbag and hat shopping stopped me. That and my good friends common sense, thanks dear. Jewellery: Murano silver lined beads bought in London aided by Yvonne who is a fabulous enabler. Hair decoration: Silk flower and feathers glued to comb, which I am sad to say got lost at the end of the night, well 3am the next morning! Verdict, it was a fabulous day and I loved, loved, loved wearing vintage style clothes and being completely over the top girly! Hi Yvette – glad to see you have joined the bloggers. Well,…. was it Kiltie, kiltie, cauld bum,… or did the sun shine? The boys should wear their kilts more often. They could start a trend down here in “Glen” Noble. The boys look fab in their kilts and I love your dress. You look very pretty in pink! Well Mandy it was a bit windy, and yes I think the boys were feeling the cold after the grooms friends made sure they weren’t wearing any boxers! what a beautiful dress. the boys look great in their kilts. What a stunning family photo! Oh, Yvette! What a wonderful photo. A very handsome family. Absolutely love your dress.